Dr. Arthur Liu received his BS and MS in Electrical Engineering and Computer Science and his PhD in Medical Engineering and Medical Physics from the Massachusetts Institute of Technology. He went on to medical school at Harvard Medical School and received his training in radiation oncology in the Harvard Radiation Oncology Residency Program and is board-certified in Radiation Oncology. 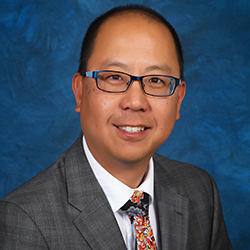 Dr. Liu has been on staff in the Department of Radiation Oncology at the University of Colorado Denver since 2007 and is currently the Director of Pediatric Radiation Oncology and the Vice Chair of the department at the University of Colorado School of Medicine. He works closely with the physicians at Children’s Hospital Colorado. His research interests include late effects of radiation therapy, quantitative structural brain imaging, and application of novel radiation approaches in childhood malignancies.